I’ve gone through a slightly strange period of change with my watches of late, which I had actually thought that I was very happy with save that I had a few too many (I get quite uncomfortable when the number hits double figures, which probably suggests that I’m not really a collector). Firstly, I acquired a Fifty Fathoms that I had no real inclination to buy until I tried it on one day over a beer. Secondly, I bought a rather lovely two-tone diver (yes, really) that I sadly had to return as it needed to have a small fault rectified; and lastly, I sold four of my watches to make room for the two mentioned above. I therefore had something of a void that I tried my best not to fill, but I fell embarrassingly short in the will power department. The watch that filled that void – completely unexpectedly – was another Panerai. I say another as I’ve owned a 233, 268, 380 and 337 in the past, and I have to admit I’m a bit of a fan. In fact, the 337 was probably a perfect watch for me in terms of both size and adaptability, but it was that adaptability (whilst not really being one thing nor the other) that proved to be its undoing. Once it had gone I knew that I’d miss having a Radiomir in the collection so I suppose there was some method to my madness in buying its successor – the slightly larger 346. In fact, they’re very, very different watches. Firstly, then, the interesting bits excluding the movement. The 346 is a gorgeous mixture of materials, textures and colours, all brought together in a 45mm package (with the Radiomir’s small “wire” lugs, though, so eminently wearable even on my sub-7” wrist). The case is made from titanium with a brushed finish. It’s relatively deep (more on that in a minute) and is topped off with a polished titanium bezel. The caseback incorporates a sapphire window to view the movement, and whilst I admit to being a fan of the Radiomir generally I do think the finish – and finished product – in this instance is genuinely beautiful. 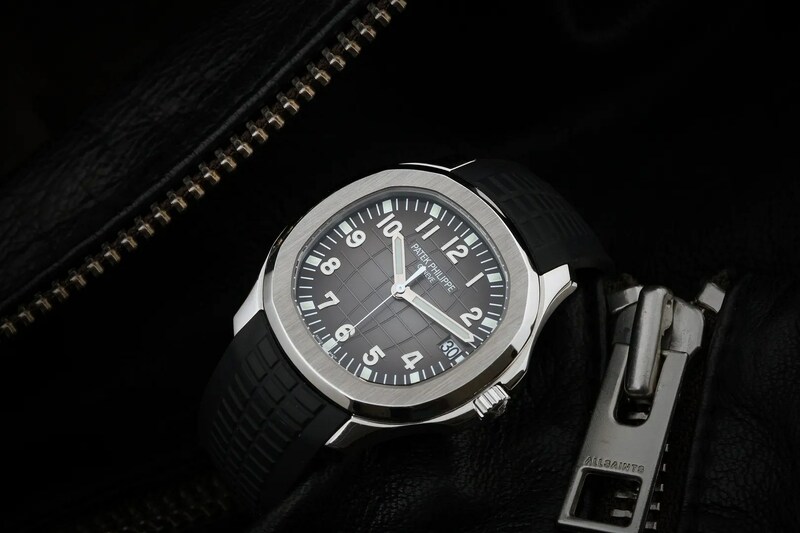 Note: as an aside, this is what Panerai say about titanium on their website: “Light, strong and hypoallergenic, the remarkable physical, mechanical and corrosion-resistant qualities of titanium have made this metal one of the most valued in fine watchmaking, as well as a material of choice for the military, aeronautical and aerospace industries. From the engineering viewpoint, its lightness makes it an exceptional material: titanium has the same strength as steel but is 40% lighter. The goodness doesn’t stop there, however, because the dial and hands are also a bit special on the 346. The former is the Panerai “tobacco” brown, with the lume in the sandwich green as opposed to faux vintage (shame, that, IMO, as the latter would work beautifully on this watch). However, the hands are 18kt rose gold, and when the light hits them they’re nothing short of spectacular. There’s a sub-dial at 9 for running seconds and a date with inverted cyplops at 3; however, you won’t find a power reserve indicator anywhere on the dial, unlike my old 268 that was otherwise very similar in terms of style and functions. Now, just a word about the strap that the 346 comes with. It’s lovely, don’t get me wrong – dark brown alligator, 27/22 with a brushed pre-V buckle. However, I wanted a less formal look and have therefore added a lightish brown Assolutemante as well. These are quite simply the best straps I’ve worn in terms of both comfort and looks, but aside from that I’ve opted for a 27/20 taper; this really does work if you don’t have a huge wrist, for two reasons. Firstly, it just gives the whole package a slightly more streamlined and elegant look; and secondly, because a pre-V buckle in 20mm as actually a fair bit less obtrusive than the equivalent buckle in 22mm. The P.2002 is the progenitor of the P.2000 series and it takes its name from the year in which the project was launched to supply Panerai watches with movements entirely designed and developed at the Manufacture in Neuchâtel. 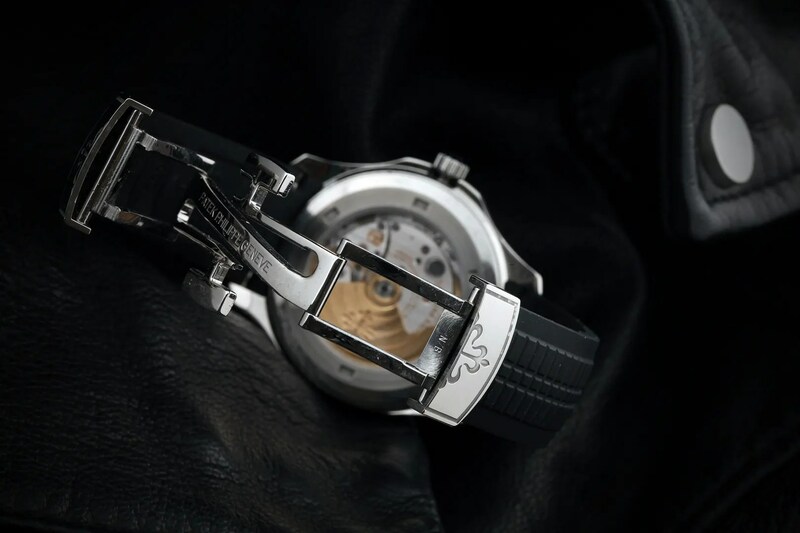 The P.2002/9 calibre consists of 247 components; it has 23 jewels and a thickness of 8.2 millimetres. Hand-wound and with a power reserve of 8 days with linear indicator on the rear of the movement (which I far prefer to seeing it on the dial itself), it has many of the key characteristics peculiar to all the calibres of the P.2000 series: three spring barrels; seconds reset device; rapid adjustment of local time; free-sprung balance; and balance wheel oscillating at 28,800 alternations per hour. The three spring barrels in series, the design of which is the subject of a Panerai patent, apparently ensures the delivery of an even, optimal force which remains stable and constant for the full 8 days of the power reserve. 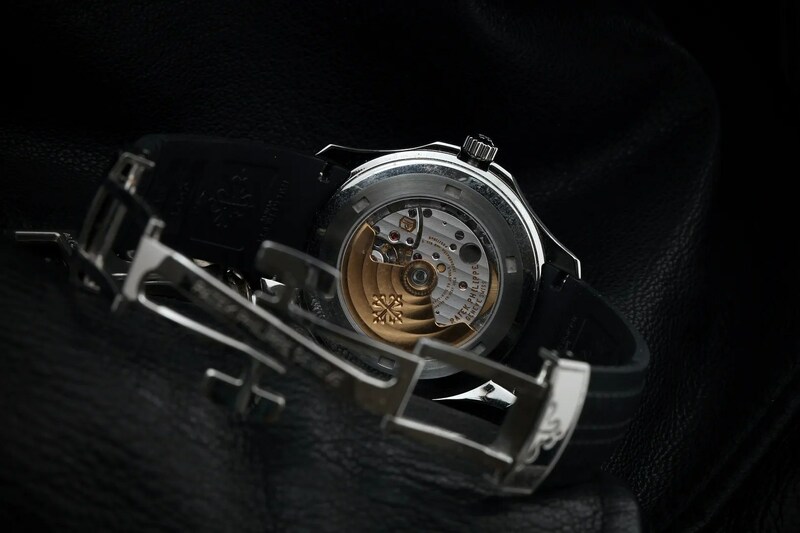 The operation of the seconds reset system is also unique to Panerai, it seems, although I don’t have the knowledge to draw comparison with other examples. There you have it, then. It may be quite apparent that I really do like this watch a lot, but then I really do like Radiomirs in general a lot so there’s no real surprise there. I do think the 346 is a bit special, though, and hopefully a sense of that comes across in these photos (apologies, by the way, but I don’t yet have a polarising filter for my new camera gear, so I had no way of cutting out the glare from my lights). Okay, I’m not going to ramble on this time (cue collective sigh of relief). However, if you fancy a bit of a read about the iconic Fifty Fathoms you could do worse than have a look here; I’ve had two previously, in fact, the other one being the DLC’d “Dark Knight”. I really have missed them both – I only sold them because I told myself they were a little too large for me – so when an opportunity arose to buy the limited edition (just 500 of this model released globally) Tribute to Fifty Fathoms I was quick to take the seller – a mate from TZ-UK – out for a beer or two, get him drunk and seal a deal. 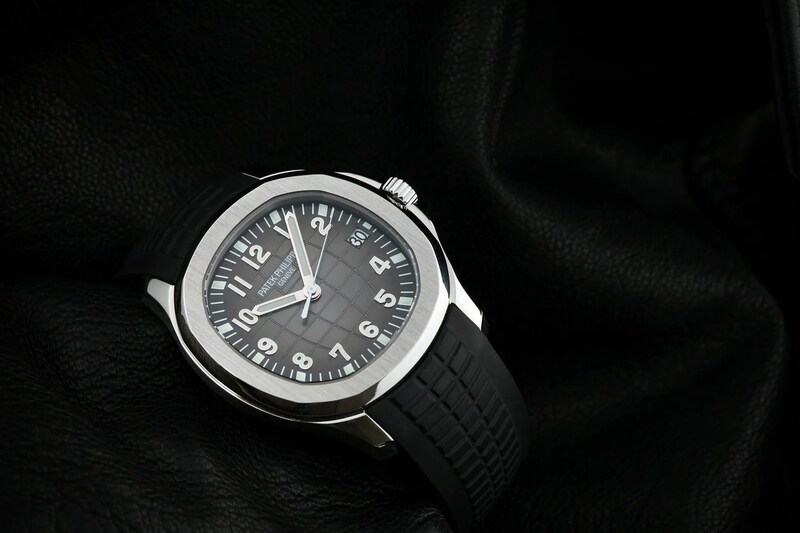 The Blancpain ref. 5015B-1130-52A shares both case and movement with the standard Fifty Fathoms that I wrote about in the post linked above. Aside from the ‘No Radiations’ symbol on the dial, the differences relate to the bezel and dial configurations. 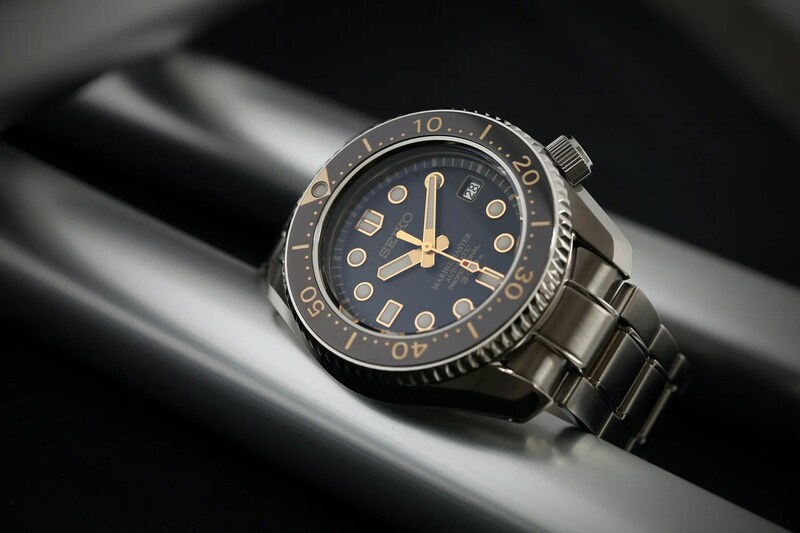 The Tribute version features a bezel with almost an identical appearance to the original Fifty Fathoms “No Radiations” from the late 60s ; that is, a slightly different font for the numerals and a minute track that continues all the way around, as you’d find on a Milsub. The dial dispenses with all four of the arabic numbers, and also features round super-luminova markers instead of applied arrow-shaped markers, together with a date aperture at 3 o’clock with white date wheel (the standard FF has the date window at 4.30, and a black date wheel). 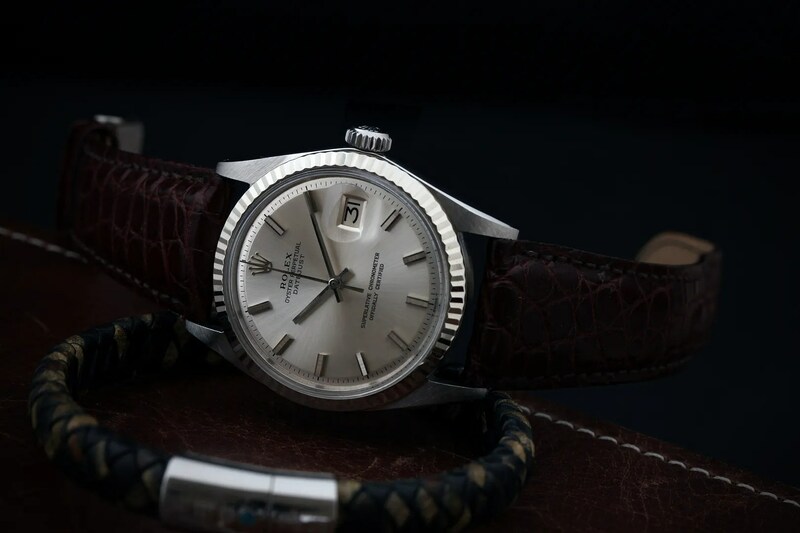 Obviously, it’s horses for courses as to which you prefer, but I love this one – the changes to the dial work for me (especially the no-rads symbol) and the LE nature of it adds a little to the ownership experience. Anyway, here’s a relatively quick and dirty photo, albeit that I lost my battle with the uber-reflective domed crystal (for now!!!). The other watch that joined the fold recently is one of the new Seiko Turtles – this is the SRP779K1 with the black dial and pepsi bezel. I actually bought it in Tenerife whilst I was buying Bea a really nice Certina chrono – the guy in the shop offered me a reasonable deal on the two, and I’d wanted to try one of these since they were released. 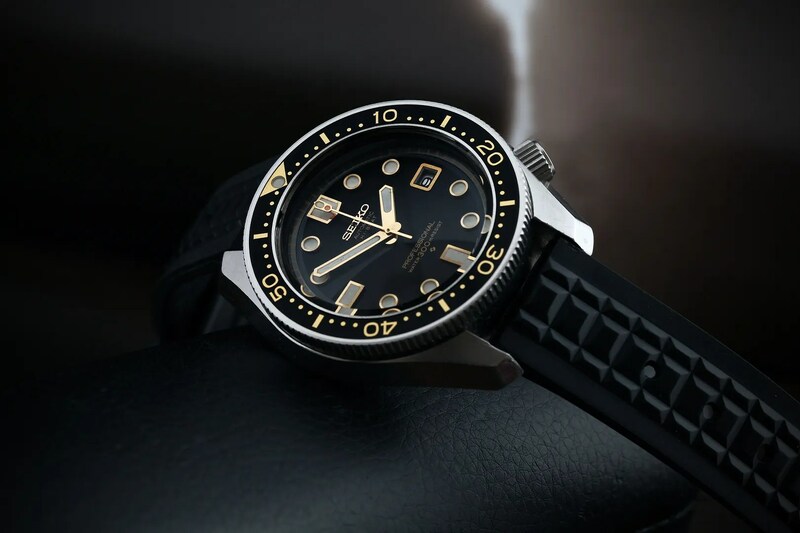 I’m not going to say much more about it, save that these watches are a reissue of the wonderful 6306/6309 vintage Seiko divers from the 70s/80s. Now, after ruining the rubber strap that it came on, and subsequently buying the OEM bracelet from another mate on TZ, I thought I’d share a photo of the matching navy and red two-piece Zulu that arrived from Sweden a couple of days ago… as you can see, it’s a lovely match and serves to pretty up what is essentially a very utilitarian design. Given that it’s Sunday morning and the alternative is to get on with some paperwork/accounts, I thought I’d post quickly about two watches that have arrived recently, both of which have made an immediate impact. 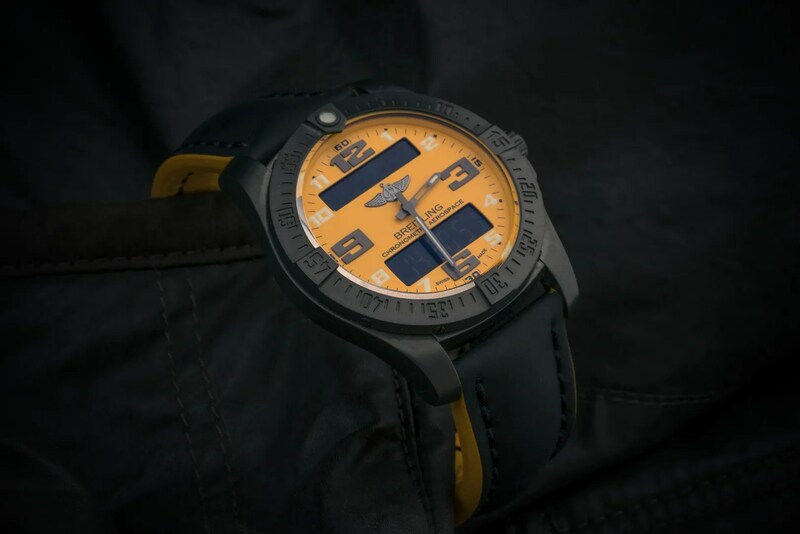 The first is a watch that’s I’ve written about in its other guises more than once already, and that’s the limited edition Aerospace Evo Night Mission – the “LE” signifying that it’s one of just 300 produced with the Cobra dial. Now, when I bought this a few weeks ago I knew that I wouldn’t keep both an Aerospace and a B-1, and I suppose it says something that the B-1 has subsequently gone. The Night Mission really is a very nice watch, and the two photos below are simply to demonstrate how the very deep yellow of the dial does still change in different light; and that it can look really good on leather. In fact, I find it much more wearable like this than on the OEM canvas strap, albeit that both look excellent. I do wonder what it would look like on a DLC’d bracelet, though! The second arrival is, I think, a bit special. It’s the Seamaster 300 Master Co-Axial, a watch that I knew I would end up buying on its release (and in fact said so on here, which if nothing else demonstrates some kind of premeditation and therefore makes me feel better!). 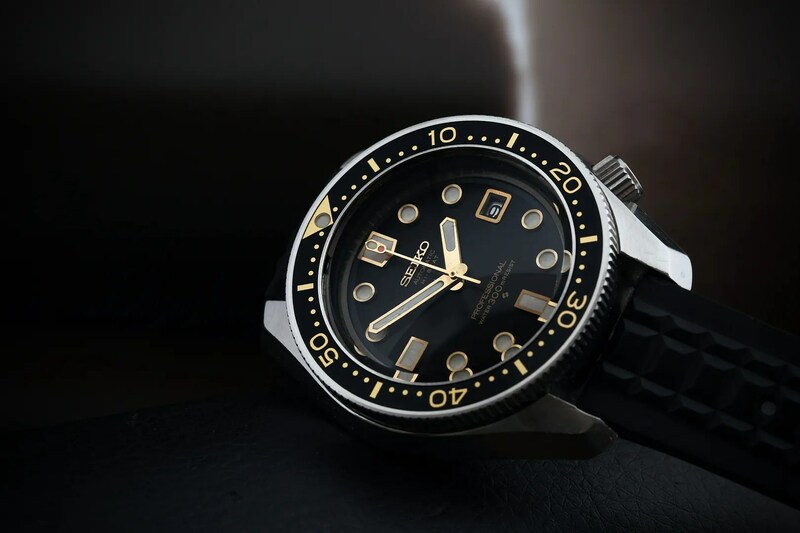 Now, there are two reasosns that i think this watch is no ordinary diver, and the first relates to its heritage. Back in the 1950s, the dive watch was beginning to capture the imagination, and to stake its claim in the world of horology. 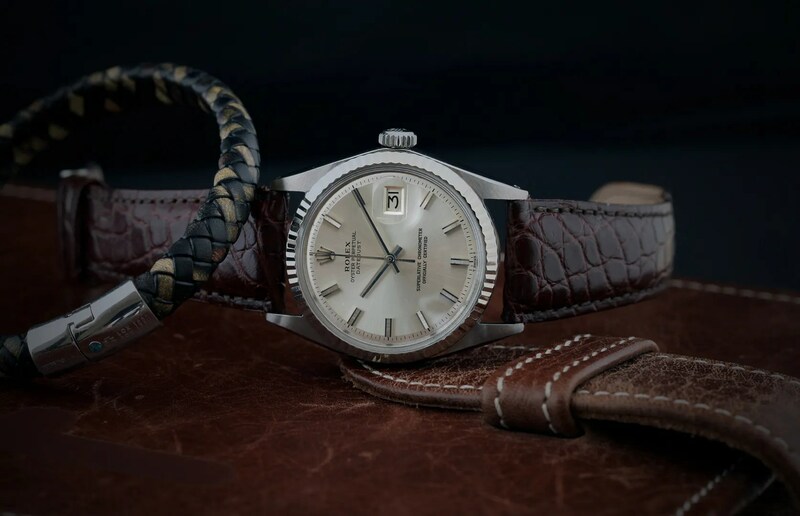 Earlier in the decade both Blancpain and Rolex “made a splash” with the Fifty Fathoms and Submariner respectively, but then in 1957 Omega released a trio of tool watches that would cement its position amongst its rivals for decades to come. 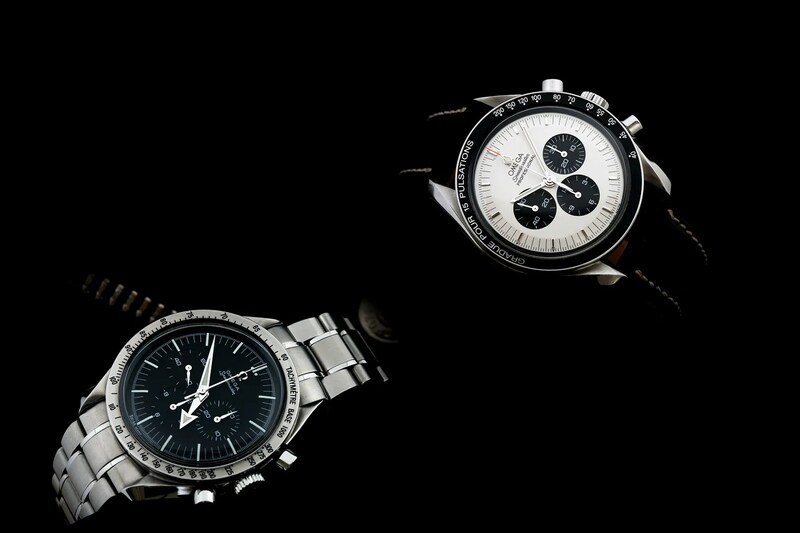 These three watches ware the Speedmaster, the Seamaster and the Railmaster; the Seamaster reference was CK2913 and although branded as “300” it was actually rated for 200m. Still, it was a big improvement on the earlier Seamasters, that were dress watches if anything and so not really worthy of the name. Anyway, it looked like this… or at least, this variant did, as there were a few. Note, though, the lollipop hand now seen on the Spectre edition! The steel case is now 41mm instead of the original’s 39. Sure, the aforementioned “Wally Schirra” Speedy stayed true to the 39mm size, but 41 is just about perfect for a dive watch. 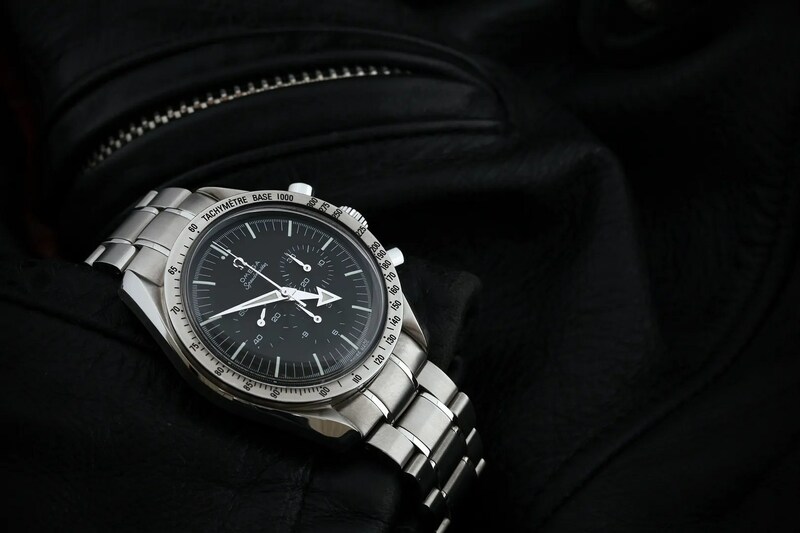 The bezel, of course, is not fragile acrylic but Omega’s LiquidMetal, an amorphous metal alloy with extreme corrosion and wear resistance, but whose shiny appearance mimics old acrylic well. The crystal is naturally sapphire but domed like its ancestor. 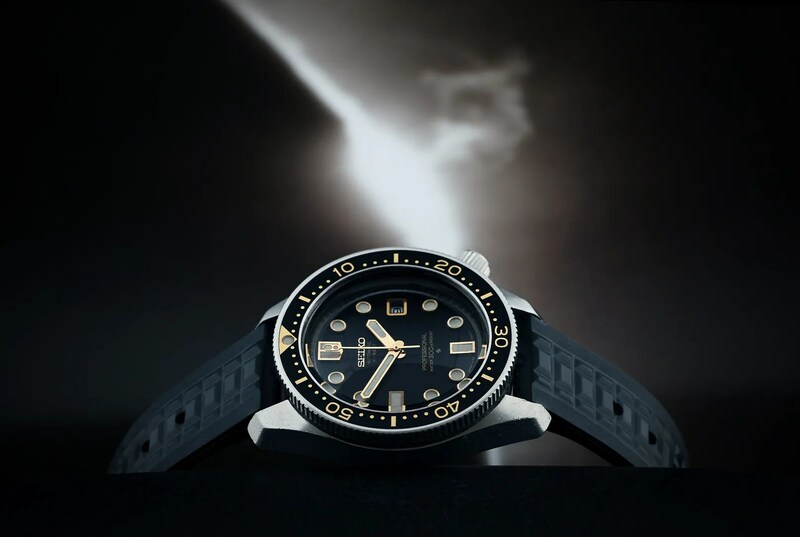 And the luminescence is provided by Superluminova instead of tritium, but is tinted a perfect faux patina gold as if the watch had aged in a retired diver’s drawer for 60 years. The dial is a matte black with a bit of texture that one might interpret to be further faux aging but looks wonderful from an angle. The dial markers, small triangles like the CK2915, are not painted on the dial but sandwiched in a layer underneath, which adds more depth and further highlights the dial texture. Best of all, in keeping with the vintage piece to which it pays homage, it doesn’t have a date function. In place of the trademark Omega hippocampus caseback engraving (which I would have liked), the Seamaster 300 has a broad sapphire display back, which fully exposes the “Master Co-axial” caliber 8400 that is part of the watch’s full name. The clear case back shows off the beautiful radially-decorated automatic movement but also is a bit of a subtle boast, since the watch is full anti-magnetic to more than 15,000 Gauss without the use of a soft iron movement cover, thanks to its silicon hairspring. In addition to its anti-mag properties, the movement sports two barrels for 60 hours of power reserve, a co-axial escapement and free-sprung balance wheel and is chronometer-certified. It also has the nifty “time zone” function, which means the hour hand can be advanced or retarded in one-hour increments without hacking the watch or moving the minute hand. While early Omega co-axial movements were modified ETA 2892 motors, the caliber 8400 represents the culmination of Omega’s R&D and is one of the finest automatic movements around today. All in all, a tremendously up to date watch with a real vintage vibe (and I LOVE the colour of the lume, which is used without comment by the likes of Panerai and JLC… it’s certainly better than lime green, FFS). I’ve had a real problem taking any decent shots of it, I’m afraid, as my lights are causing havoc with the domed crystal. However, here are a couple that came out reasonably well and I’ll try to take some more as and when time permits. A few years ago, I’d not have considered buying a Seamaster. I thought they looked a bit bland, and really didn’t get the crown-operated HEV (I still don’t, in fact) for which there are seemingly far better design options. Over time, though, I’ve really warmed to them as an all-purpose watch and for the last couple of years I’ve been keeping a beady eye out for the right one to come along – not just here, but everywhere. I’ve missed a couple, rejected dozens, but a few days ago an absolute beauty was listed for sale on TZ-UK by one of its resident watchmakers. 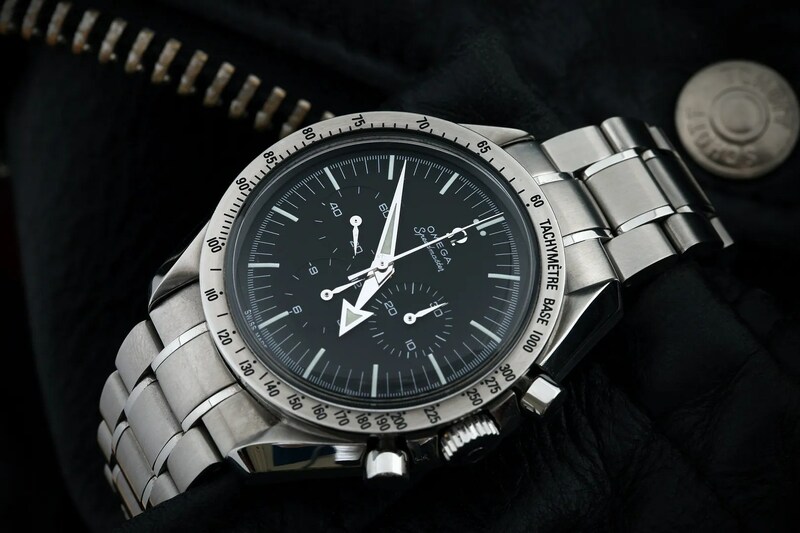 In fact, by an ex-Omega watchmaker, no less. The Omega cal. 1120 is an amazing movement, and an excellent choice for this watch. The movement was first introduced in 1996, and Omega uses the ETA 2892-A2 as the base ebauche, and heavily modifies it to produce the 1120. The base ETA 2892-A2 is widely considered the best movement ever produced by ETA (first introduced in 1975, with a lineage going back much further with Eterna). Many, many high end watch manufacturers (like IWC and Cartier) also use the 2892-A2 as a base movement. Why? Well, cost is no doubt a factor. However, I submit that many watch companies all come to the same conclusion: They could spend the money to design and manufacture their own movement in-house and still not match the technical marvel which is the 2892-A2. 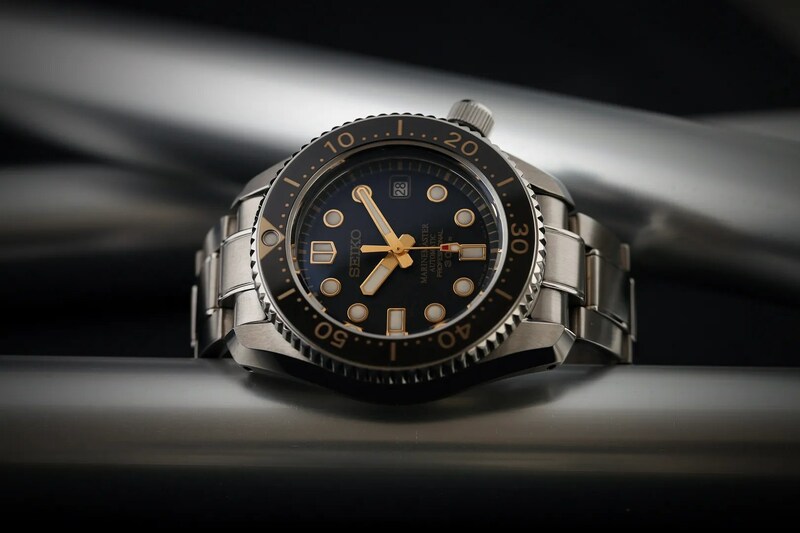 Don’t take my word for it – research the treasure trove of articles on Timezone by such horological luminaries as Walt Odets and others who closely examine the attributes of the 2892-A2. All in all, a fantastic watch, and a long-time target now acquired. After all, these forum darlings haven’t changed all that much for decades, right? Well, having had a few myself I can’t argue much with the fact that they’re hardly groundbreaking, but I’m also happy to have two of them now, both slightly different to the norm. The latest arrived yesterday, after a wait of many, many months; in fact, even Bea said that I’ve been wittering on about them for ages! This one started off as a standard 3570.50 Moonwatch, but it’s been modded with a “Mitsukoshi” dial, steel handset (including an orange-tipped central chrono hand from a Planet Ocean) and a pulsations bezel. (By way of context, the Mitsukoshi “Domino Dial” Speedmasters were originally a limited run of 300 watches that were manufactured by Omega for the Japanese department store of the same name – this would have been around 2003). 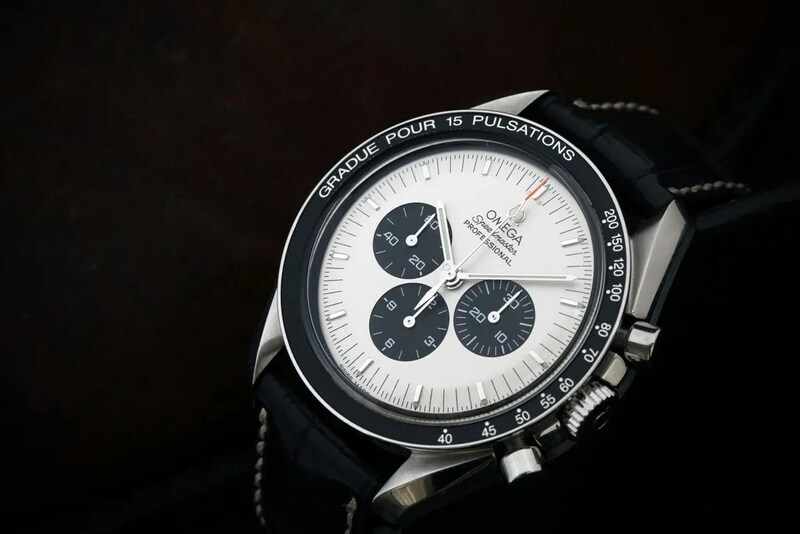 The dial is white, with an applied logo and black subdials, with the correct reference of those that left the factory with this configuraion was 3570.31. I mentioned that I have two that are a little different, though – the other one is the ’57 Broadarrow “Replica”… the obvious differences being the Broadarrow hands and stainless steel bezel. They make a nice pair, I think. It really has – two amazing incomings, and two yearnings put to bed once and for all! 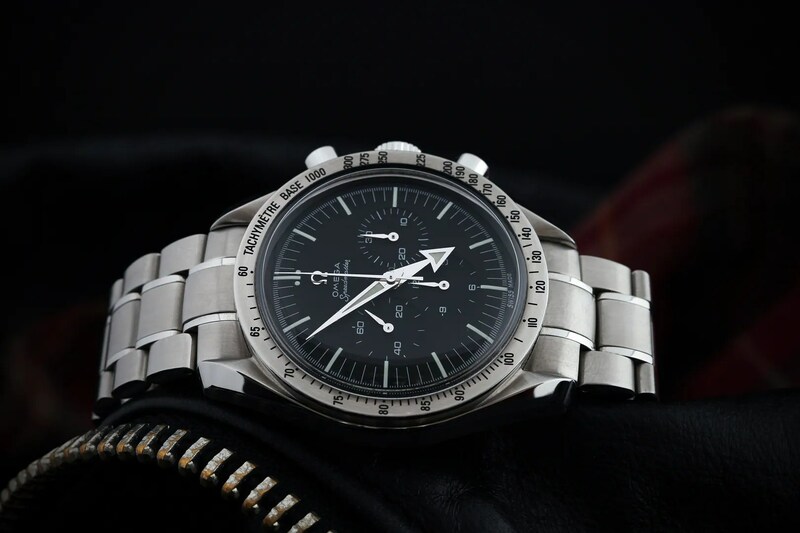 First of all, a Speedmaster. Now, I have a long history with these watches having owned a multitude in the past, culminating in a wonderful Ed White from 1967. I sold that during a very difficult period in my life when my mind was all over the place, and having tried unsuccessfully to agree a “current” value with the member who bought it from me I found it was then sold to someone else here (identity unknown and the least said the better, I suspect). Anyway, I tried (and flipped) a FOIS, having hoped it would scratch that particular itch; and then set about buying back my old ’71 145.022 from the present owner. I would have bought it too, but then – mid-negotiations – a friend on TZ-UK kindly offered me his gorgeous 3594.50 Broadarrow. I’d wanted one of those since I first laid eyes on them, and a deal was completed in minutes. The 3594.50 was released in 1997, and was produced until 2003. 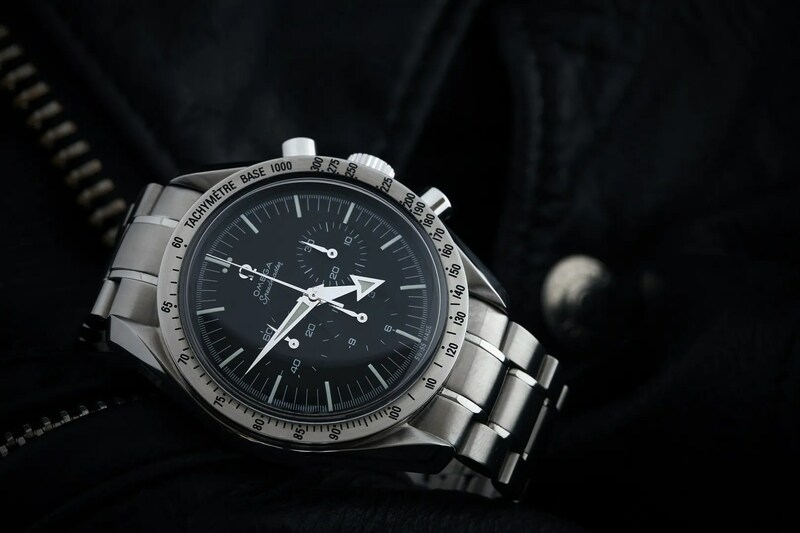 It differed from the regular 3590.50 Speedmaster Professional of the time in a number of ways, though. It had an applied logo, Broadarrow steel hands, a stainless steel bezel and a “non-Professional” dial; the cases, however, were identical. 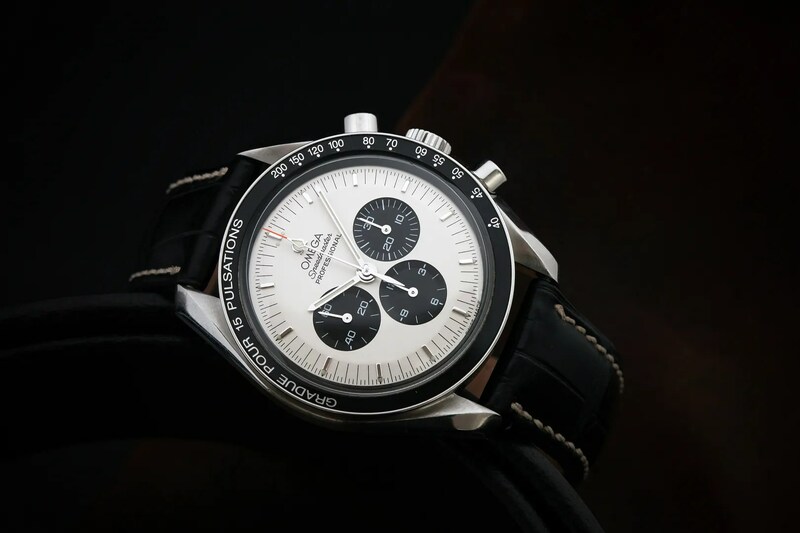 Another difference to the standard Speedy Pro was the case back – the 3594.50 just had the seahorse logo and the word “Speedmaster” (like it’s predecessor, in fact). It had a Lemania 1861 ticking away inside, and early versions came on a bracelet – initially without pushers on the clasp – although later it was released on a calf strap similar to that on today’s FOIS. The modern version of the ’57 trio is, of course, the current co-axial, which is nice enough but something of a lump IMO. It uses the cal. 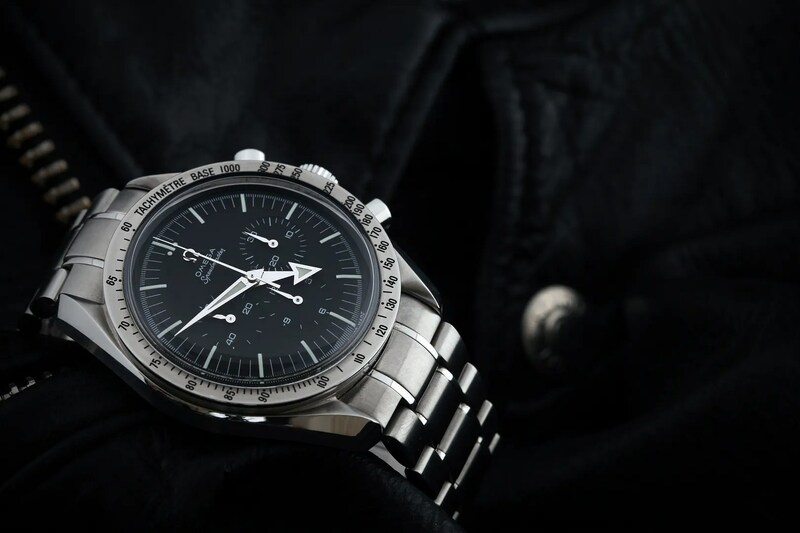 9300 and – with its display back – typifies the trends that have more latterly defined Omega design. I think it looks great in photos, but far less great on the wrist… maybe that’s just me, though. The second arrival really is a bit special, and culminates from my love of the Seiko MM300. I’ve had a few of those (!) 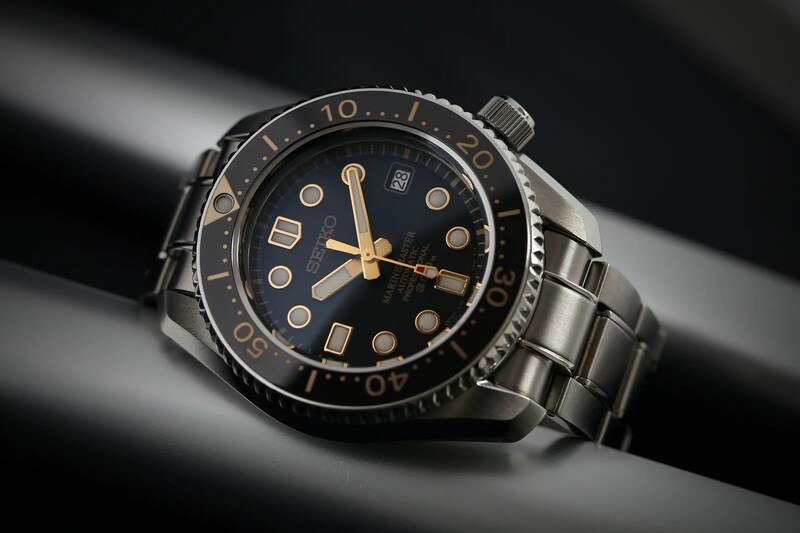 and when I bought – very recently – the LE SBDX012 I did say that the only watch that would knock it from it’s perch was the 6159-7001 (a genuine grail amongst vintage dive watches, and not something that I ever expected to find). 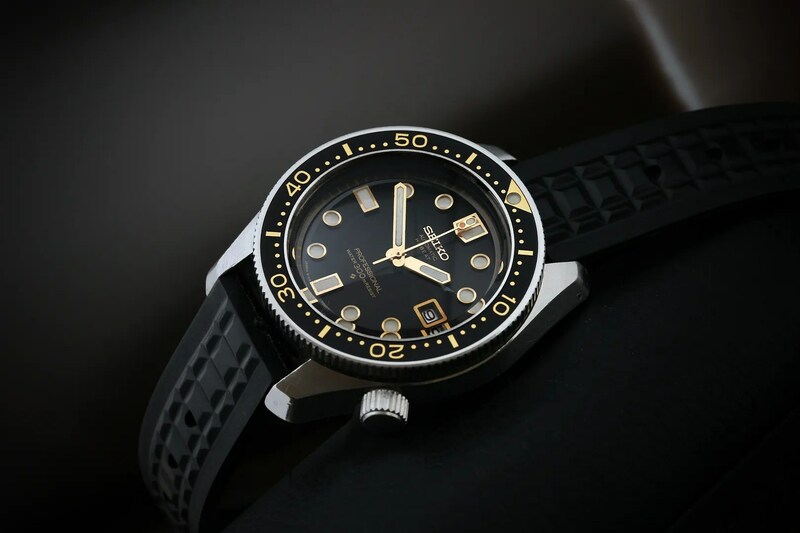 This was the first of Seiko’s “Professional” divers, made for just a couple of years from 1968-9; in fact, the next Professional diver was then some 7 years away in the shape of Tuna 6159-7010… another hugely important watch, in fact. Inside was the high-beat 6159 movement also found in Grand Seikos of the time, and this was housed in a monocoque case that we now see in the MM300 series. The 6159-7001 that I’m wearing as I type is a seriously good example. Showing appropriate signs of use on the case (and it won’t be polished, ever) it’s been through my friend Duncan’s magical hands; in fact, you can read about his work on this watch here. Aside from the various NOS parts that were fitted, the really interesting thing is the “resist” dial… very scarce indeed, and all the more collectable because of that (yes, even though the dial would originally have been a “proof” – they’re far more common, it seems). It’s also quite mesmering to watch the sweep of the second hand as it traverses the dial at 36000bph; all too often the old divers had a much lower 21,600 bph (or even 18,800ph)… wonderful, really, and so elegant. I have to say that to land one of these at all is fortunate – I’ve missed a couple in the past and had pretty much given up, despite expressing my interest on here more than once. However, to finally find one in this condition is nothing short of remarkable, and I’m over the moon with it. On the wrist it’s absolutely jaw-dropping, although I have to say that I seem to have failed miserably at conveying the real beauty of it in the photos below. I’ll take some more when I get some time (it was all a bit of a rush today, unfortunately). See what I mean when I said it was a good week? Perhaps it was just meant to be… me and the MM300, I mean. Believe it or not, I’ve had 5 SBDX001s. I don’t actually know why I sold them all, because I do love the damn things… maybe it’s just been that I’ve had too many watches at the time, and that they’re not particularly… glamorous? Whatever the reason, I’ve always known that I’d have another and keep it although I’ve found myself increasingly drawn to the limited edition ‘003 and ‘012. 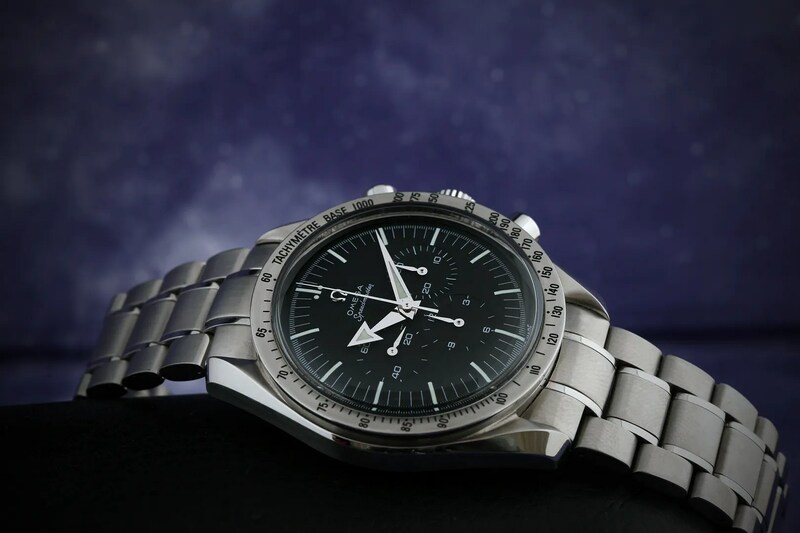 The SBDX012 is a 50th Anniversary model, limited to 1000 pieces; they’re already quite hard to find, and I’m sure they’ll only go up in value over the coming years. 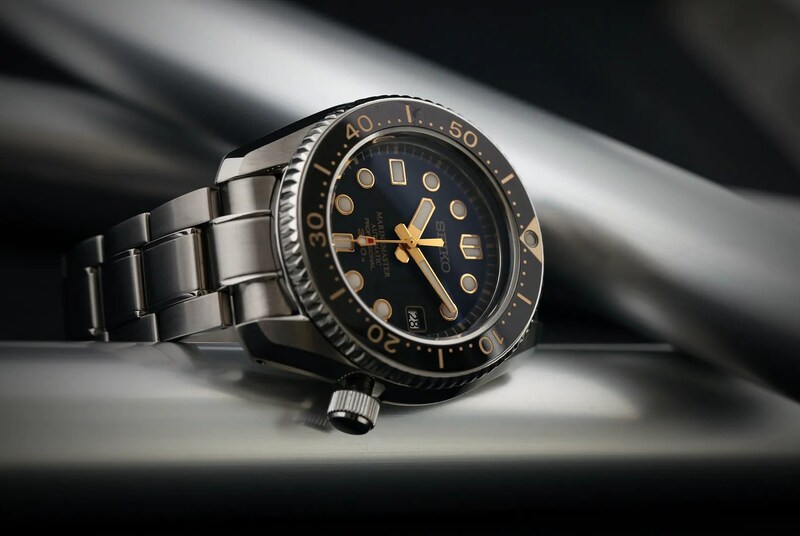 In truth, they’re not radically different to the ‘003, save for the use of the gold accents for the bezel markings and the text “Marine Master Professional” on the dial. 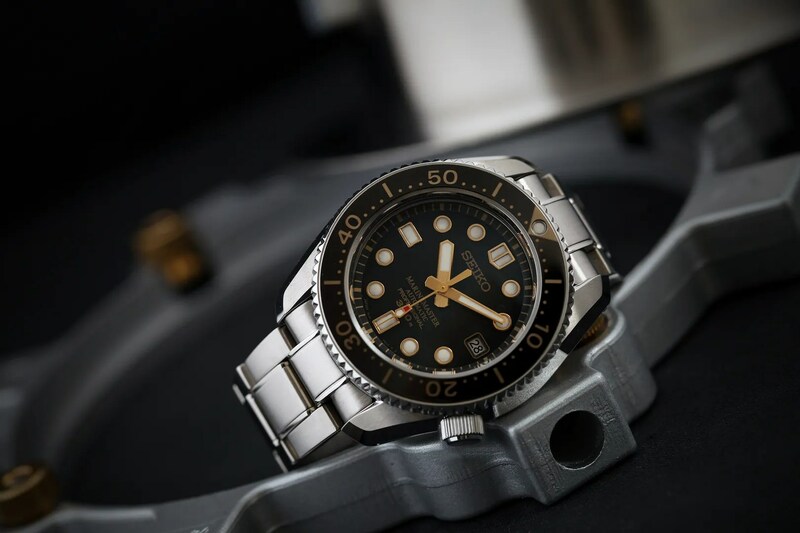 (From Seiko’s site, translated by google “the character on the bezel is subjected to a golden finish by anodic oxidation treatment of laser… By the electrolytic treatment anodised material, a surface treatment for generating the artificial oxide film. Colour is born by the refractive index of the light…”) They also come with both the steel bracelet and the rubber strap with matching gold plated buckle and keeper, whereas the ‘003 comes with a strap only. Oh, and one other difference that I really like – the ‘012 has a splash of red on the second hand, as a lovely tribute to its predecessors. Much has been said about the bracelet in the past, but I’ve always found it excellent. Photos tend to show what appears to be a gap at the case, but this is merely a shadow from the faceted lugs, and in truth it has fitted to perfection on every watch I’ve owned. The non-signed crown is of no significance to me whatsoever, and the only thing I’d change in an ideal world is the crystal material – it’s Hardlex, and I’d sooner have sapphire. The movement is the Grand Seiko 8L35, as it’s always been in the MM300; beating at 28,800vph and rated at an unregulated -10/+15 spd out of the box. (They can, of course, be regulated but the one on my wrist as I type this is running at +4 seconds and has been doing so consistently over the last few days.) It’s worth noting, though, that – unlike the ‘001 – the movement used in the ‘012 features MEMS technology. What is MEMS? Aside from MEMS, and (incidentally) the Diashield-protected case, what’s really won me over with this watch is the gold accents on dial, hands and insert… it looks absolutely wonderful but at times – when the light is right – it dazzles. I’ve tried to pick this up in the photos below, but have probably failed miserably. Suffice it to say my ceramic Sea Dweller is now up for sale, because this won’t be going anywhere. The biggest selling Rolex isn’t, as many believe, the Submariner. 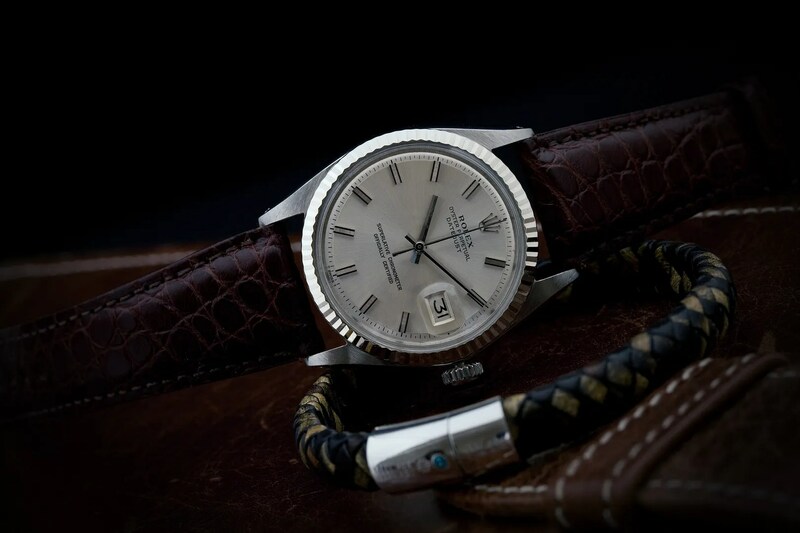 In fact it isn’t a sports watch at all – it’s the venerable Datejust. First released in 1947, this is the watch that – for most people – symbolises the brand, and before this week I’d already owned five different models. All of them were lovely, and I’ve missed having one in my collection for some time now. The 1601 is one of the most classic of all, with it’s plexi crystal, non-quickset date and open sixes and nines on the date wheel. This one, from 1970, will have been one of the first to house a hacking movement (a calibre 1575, even though it will almost certainly have 1570 stamped on the bridge); it also has a “wide-boy” non-luminous dial, which I absolutely love. I’ve actually had it for a few days now, and have worn it almost constantly with both a suit and with jeans. it manages to bridge the gap between dressy and casual completely effortlessly, and whist it’s relatively small by todays standards at 36mm, it wears really well on my 6.75″ wrist. Condition-wise, it’s about as minty as a 45 year old watch could be, and is keeping time within a few seconds a day. 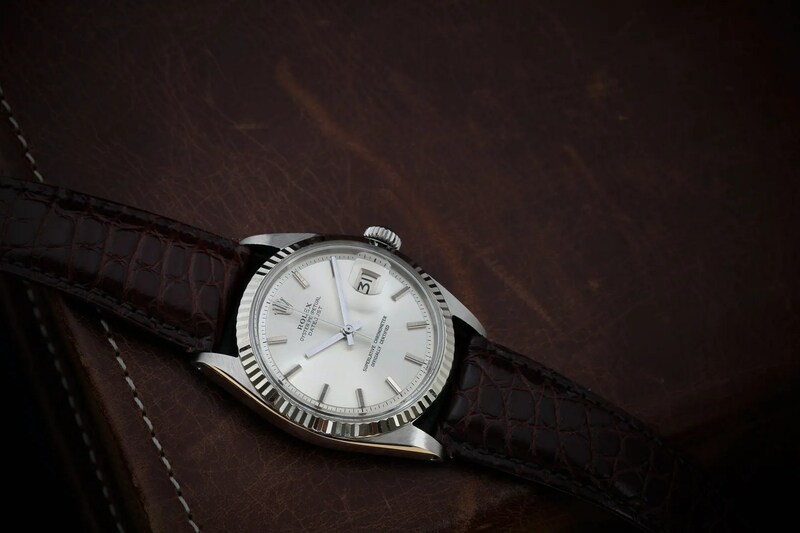 I’ve posted a few WTB’s for a jubilee bracelet but to be honest it looks so nice on leather that I don’t think I’ll bother. Its wearing a Hirsch Regent alligator strap in these photos, and although I’ve tried a few others this is by far my favourite. I well remember a couple of years back, contemplating a dressy sports watch and a real dilemma at the time. 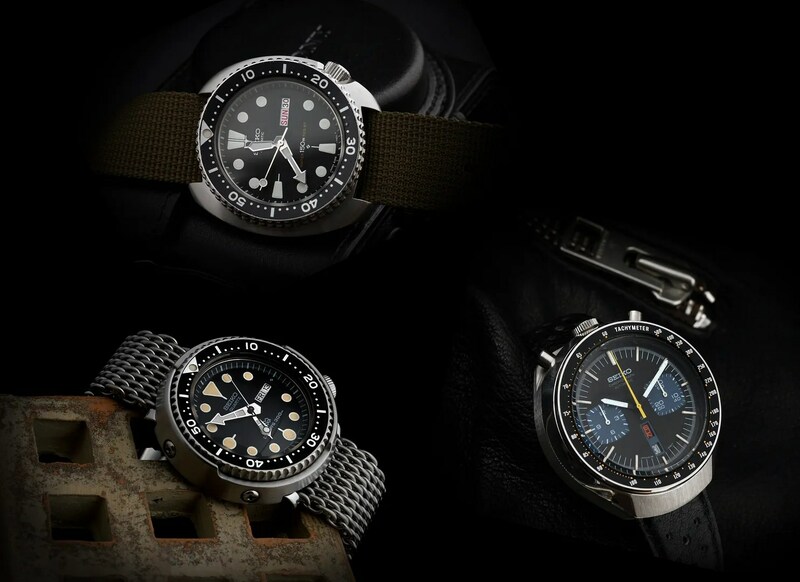 I’d tried on the Aquanaut in both basic and dual time guises by the time I opted for a APRO 15400, and even at the time I was unsure as to whether I’d made the right decision. I suspect that if I’d gone for the Ultra Thin 15202 I may have stuck with what I had, but – gorgeous as the 15400 was – it was probably a tiny bit too large for a 6.75″ wrist; wearable, but just pushing the limits a bit. Anyway, fast forward to a couple of weeks ago and I found myself with two perpetual calendars, one of which was always likely to go. When a friend messaged me hinting at the possibility of a trade my mind was pretty much made up; consequently, my newly acquired JLC was soon being packed up for postage and my first Patek Philippe was heading my way. 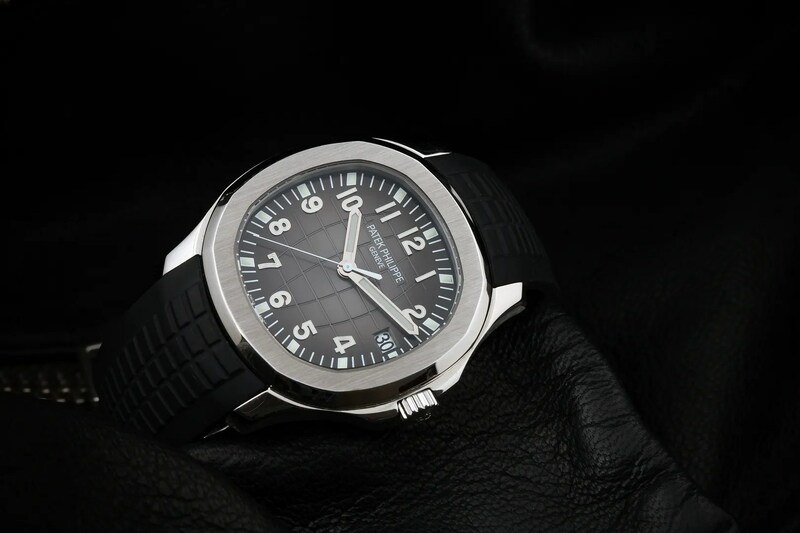 The Aquanaut was first released by Patek in 1997, and it included a couple of notable innovations for the time. It was the first watch rated to 120m that had an exhibition back, and it was Patek’s first watch to be offered without either a bracelet or a leather strap. (The “tropic” strap, incidentally, is an absolute joy… I’ve never worn a strap as comfortable, and it is an absolutely perfect match for the watch IMO. The relatively small bi-fold clasp is also quite magnificent.) There have been a number of iterations over the years, culminating with the launch of the 516X series in 2007. 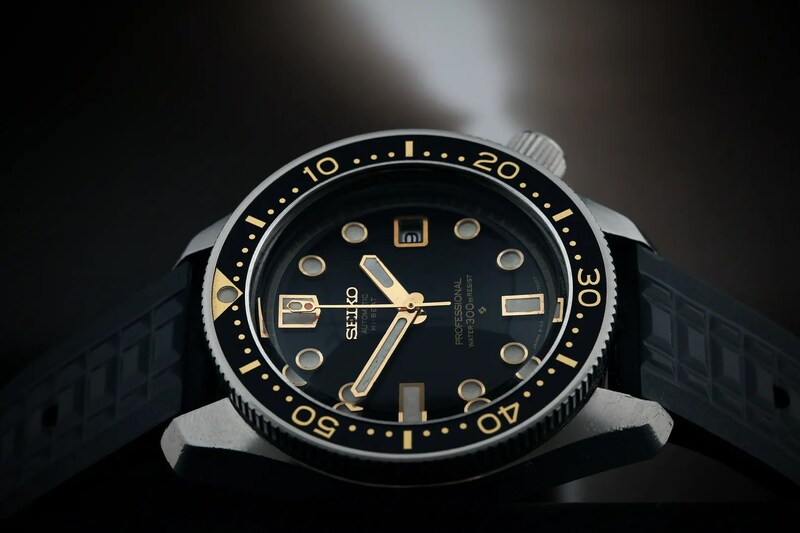 The 5167 is the “Jumbo” version, spanning 40mm measured diagonally from 10-4. The case is slim (the movement is only 3.3mm high) and the watch is incredibly light to wear, particularly on the Tropic strap. 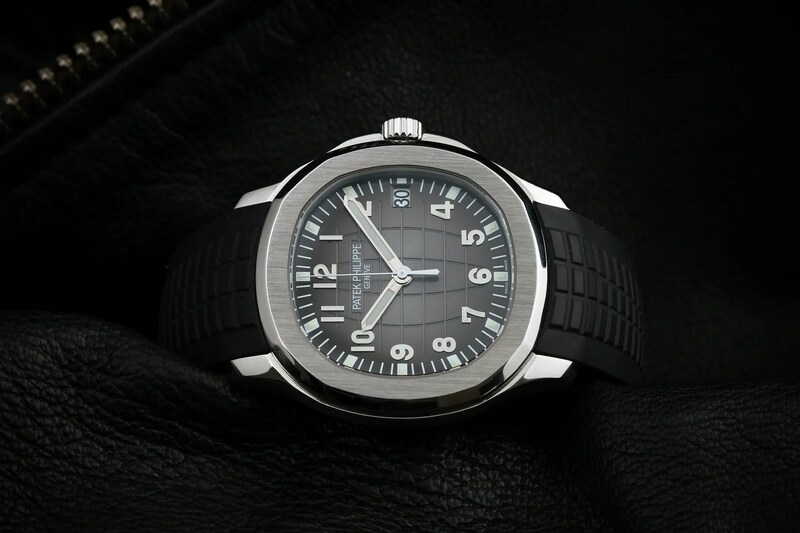 The dial is simply magnificent, taking on a kind of anthracite appearance that seems to radiate light – hopefully you can see this in the photos below. The finish on both case and dial is completely perfect, testament to the quality of engineering that, like with many watches that push the boundaries of the cost:value proposition, needs to be seen to be properly appreciated. Again, the quality of finish is exemplary – even under a 10x loupe there really is nothing that would raise an eyebrow. Just perfectly finished, and beautifully decorated. All in all, I feel that the long wait for this watch has been worthwhile. Yes, it costs a fair bit for a “simple” three-hander with date, but the residuals are exceptional and I anticipate that this watch will be worth a fair bit more in a few years than I paid for it; that alone puts a different perspective on the value proposition I mentioned earlier. It’s also wonderfully versatile, as even with the tropic strap it can be dressed both up and down with consummate ease. Most importantly, though – I absolutely LOVE it. Yes, the JLC that went in trade is a wonderful watch; however, this is the one watch I’ve been lusting after for years, and for me at least the trade made absolute sense.